The tech giant has big solar plans in China, where renewable energy continues to struggle with curtailment issues. Earlier this year, Apple announced that all of its U.S. facilities, and 87 percent of its worldwide operations, are now fully powered by renewable energy. But offices, data centers and retail stores represent only 1 percent of the Apple’s carbon footprint. So now the electronics giant is turning its attention to tackling greenhouse-gas emissions in its China-based supply chain. Apple announced on Wednesday that it will build 200 megawatts of solar in China and push its manufacturing partners to make similar commitments. In total, Apple plans to install more than 2 gigawatts of new clean energy in partnership with its suppliers in China. As part of the initiative, iPhone maker Foxconn will construct 400 megawatts of solar by 2018. These new programs are expected to avoid more than 20 million metric tons of greenhouse-gas pollution between now and 2020, equivalent to taking nearly 4 million passenger vehicles off the road for one year. 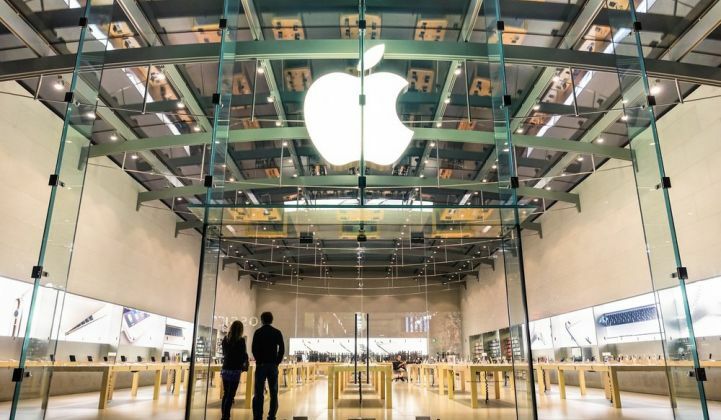 Apple announced this week that it has also completed construction on two solar farms in southern China with a combined capacity of 40 megawatts. The output from these installations is greater than all of the electricity used by Apple’s offices and retail stores in China, making its operations carbon-neutral. Earlier this month, Apple joined 80 other companies in signing the White House’s American Business Act on Climate pledge. Though its U.S. operations are already running on 100 percent renewable energy, Apple said it will bring an estimated 280 megawatts of clean power generation on-line by the end of 2016 through investments in Arizona, California, Nevada, North Carolina, Oregon and Sichuan province, China. Apple’s recent $848 million, 25-year power-purchase agreement with First Solar underscored the company’s commitment to reaching its target. The company's new clean-energy commitments come less than two months before the highly anticipated United Nations climate summit in Paris. The U.S. and China have achieved an unprecedented level of bilateral coordination on climate issues leading up the negotiations. In September, several city, state and provincial leaders in the U.S. and China signed on to a new declaration to take enhanced actions to mitigate carbon emissions. Leaders in both countries also agreed to collaborate on the development of carbon markets. Last year, the two countries signed on to a historic climate agreement that would see the U.S. reduce emissions 28 percent by 2025 and would see China stop emissions growth by 2030. China also committed to increasing its use of clean energy to around 20 percent of primary energy consumption by 2030. To that end, China has more than doubled the amount of solar capacity installed in the first nine months of 2015 compared to the same period in 2014. According to the National Energy Administration, China installed 9.9 gigawatts of solar capacity from January to September. Utility-scale projects account for 8.32 gigawatts, and distributed projects account for 1.58 gigawatts. China’s goal is to install 17.8 gigawatts of solar in 2015, with an additional 5.3 gigawatts of capacity available for high performing provinces. Installations under these quotas are expected to continue into 2016. Total installed solar capacity in China is now just shy of 38 gigawatts. For comparison, the U.S. solar market surpassed 20 gigawatts of solar capacity in the second quarter of this year. But there’s another story behind China’s impressive solar numbers. While the economic powerhouse has developed an impressive domestic solar market from nothing in about five years, solar projects are increasingly running into grid congestion issues and interconnection delays. According to Chinese government data, 9 percent of the country's solar output was curtailed between January and June due to grid constraints. In the province of Gansu, curtailment reached 28 percent. The latest figures show national curtailment levels increasing to 11 percent through the third quarter of 2015. This problem isn’t unique to solar. According to Reuters, one-fifth of China's wind electricity was curtailed in the first quarter of this year.